Watch full Naruto Shippuden Season 20 Episode 50 English Dubbed full HD online. Naruto Shippuden Episode 463 English Dubbed online for free in HD. Kaguya voices her hatred for her sons. Outraged by Black Zetsu’s claims, Naruto frees himself and Sasuke, disagreeing with him about those who shape shinobi history and how mothers should feel about their children. Sasuke surmises they need to create an opening to seal Kaguya, Naruto decides to use a certain jutsu, and starts filling Sasuke in on it. Black Zetsu dismisses them, pointing out Kaguya can absorb all jutsu. From afar, Sakura observes them, relaying the information to Kakashi, who is still in awe of Kaguya’s power. Naruto’s shadow clone heals Obito. Sasuke is dubious about Naruto’s strategy involving a jutsu he practiced in secret even more than the Rasengan, but agrees to try it. He engulfs Kaguya with Amaterasu, which she effortlessly absorbs. Naruto moves in and transforms into a group of naked men, stunning Kaguya. Sakura is irate that Naruto would try that on someone so powerful, but is shocked when Naruto lands a hit on Kaguya. Kakashi wonders if Jiraiya is watching Naruto save the world with perverted ninjutsu. Sasuke teleports Kaguya between himself and Naruto, almost making physical contact, but Kaguya teleports everyone to her ice dimension, locking them in place with ice. 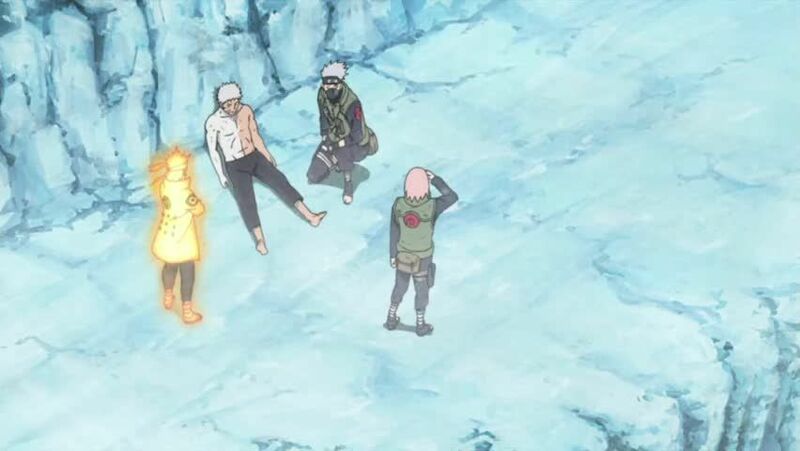 Naruto’s shadow clone, Sakura, and Kakashi discuss Kaguya’s jutsu. Kaguya escapes the ice, and moves in to absorb their chakra again. Sasuke frees himself and Naruto with Amaterasu and Kagutsuchi. At Black Zetsu’s suggestion, Kaguya splits them up, throwing Sasuke in her desert dimension. Naruto tries to keep the portal open, to no avail. Naruto evades Kaguya, who causes the surrounding landscape to attack Naruto. Obito wakes up, and is brought up to speed on the situation. They decide to assist in the battle. Sasuke wanders through the desert dimension. Naruto’s clone finishes explaining the situation to Obito. They watch the original Naruto dodging the terrain, before finally allowing himself be captured to draw Kaguya out. Obito notices Kaguya’s use of Spaceâ€“Time Ninjutsu, and is certain that he can sync his Kamui with it, and bring Sasuke back if he is in another dimension. Due to the great chakra cost it would require, Sakura volunteers her stored chakra. Obito is prepared to die if he has to. In the real world, the four Hokage converge on Madara’s severed lower half, and discuss what has happened and how to proceed. Hagoromo’s chakra manifests itself from Madara’s lower half, and introduces himself to the four.